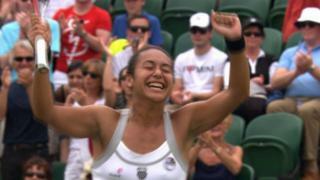 Watch highlights and hear reaction from Great Britain's Heather Watson as she completes a comfortable 6-1 6-4 victory over American Jamie Lee Hampton. Watson is the first British woman to make it into the third round at Wimbledon since 2002, when Elena Baltacha reached the last 32. The 20-year old world number 103 from Guernsey is pleased with her performance and thanks the Wimbledon crowd for their "amazing" support.